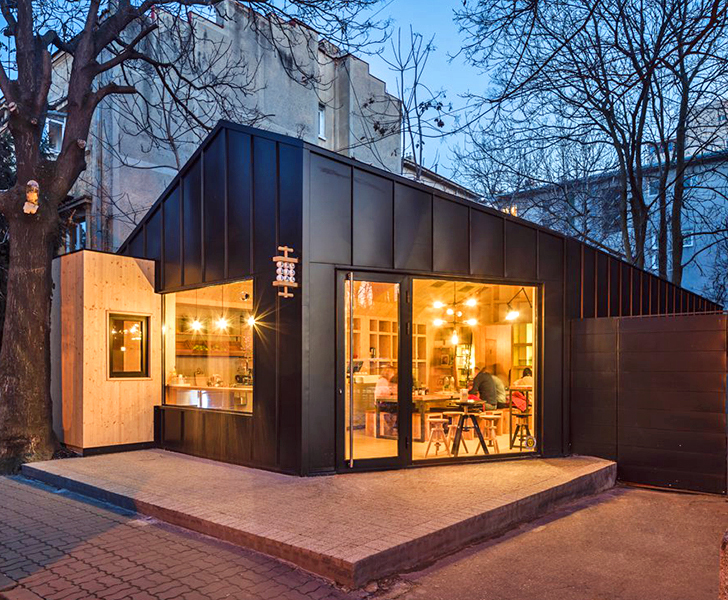 A contemporary yet cozy cabin-like structure has popped up in the heart of Bucharest. Created as a charming respite from the city’s hustle and bustle, the wood-lined structure houses Frudisiac, a contemporary juice bar and cafe. Not a Number Architects designed the black metal-clad building, starting with the renovation of the site’s derelict shed. Clad in standing-seam black sheet metal, this urban cabin has a monolithic and low-key appearance during the day. In contrast, the interior is covered with light spruce panels. Large windows and skylights flood the cafe with natural light during the day. At night however, the building appears to glow; large openings frame indoor activity and the indoor illumination accentuates the sharp contrast between metal and wood. In addition to the wood-lined interior, the Frudisiac juice bar and cafe uses its spatial layout and furnishings to create a rustic and inviting atmosphere. The cafe is organized around a long wooden picnic table, where customers can sit family-style. Furnishings are kept minimalist and are mostly made from timber with metal accents. The cafe space is separated from the rear kitchen with a large orthogonal bookshelf. Clad in standing-seam black sheet metal, this urban cabin has a monolithic and low-key appearance during the day. 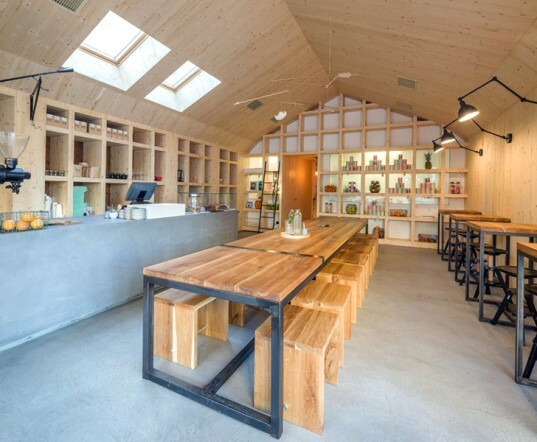 In addition to the wood-lined interior, the Frudisiac juice bar and cafe uses its spatial layout and furnishings to create a rustic and inviting atmosphere. In contrast, the interior is covered with light spruce panels. Large windows and skylights flood the cafe with natural light during the day. At night however, the building appears to glow; large openings frame indoor activity and the indoor illumination accentuates the sharp contrast between metal and wood. The cafe is organized around a long wooden picnic table, where customers can sit family-style.